For years Scion has brought cars to SEMA, but they've always been blobby xBs with turntables in them or whatever. Now they have the FR-S, and we actually care about their three newest tuned cars. The Toyobaru twins were designed with the aftermarket in mind, and there have already been some fairly wild interpretations of the new sports coupe, like Evasive's supercharged FR-S that's also going to the show this week. We're sure there will be tons of over-the-top FR-Ss at SEMA, so perhaps it's not a surprise that Scion's own cars are fairly conservative. Scion got their three show cars done by giving three different tuning shops a car, $15,000 and three months of build time. There are three distinct styles, one from the Midwest, and one from the East and West coasts. The Midwest representative was done by John Toca out of Chicago. 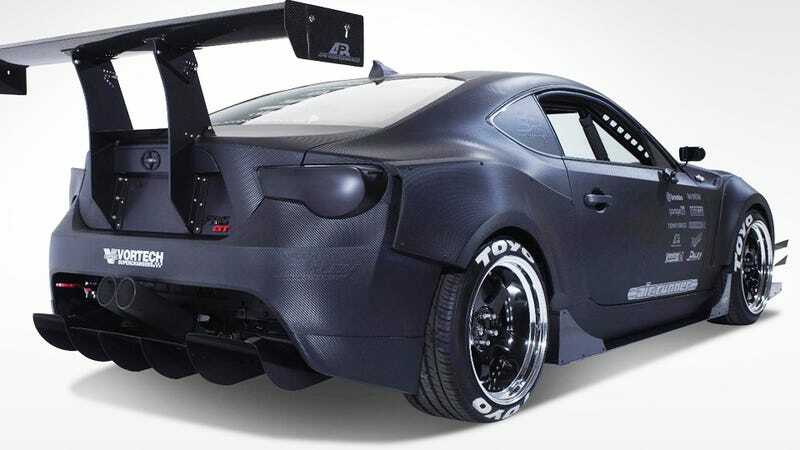 The "Carbon Stealth" car has some carbon fiber pieces, a nice drop, a lot of audio work, and a supercharger. Representing the Best Coast is Daniel Song's "FR-S GT". It's the track-prepped car of the bunch, supposedly drawing off of the SUPER-GT GT300 cars. Toyota actually runs a Prius in that series, and Subaru runs a BRZ there, but we're not complaining. Here on the East Coast Scion got Chris Basselgia of Lebanon, Pennsylvania to make this "Minty Fresh" car. We think it looks like it's some kind of hospital product, or maybe just industrial waste. What do you think — are you finally excited about Scions at SEMA?